Luggage straps (or luggage belts) can securely bind one or more suitcases, rolling duffels, and uprights closed. They are length-adjustable- check out the table below for their exact adjustable lengths (Source). They also come in bungee styles- but this review is for buckling luggage straps (Source). They quickly unbuckle should a TSA agent need to rifle through your bags​. Since most of these luggage straps ship in pairs of two, you'll be able to criss-cross your luggage with the strap for an extra-tight bind. In addition, a luggage strap can form a convenient handle for your luggage, making it easier for notorious baggage handlers to heft it in and out of airplanes and baggage carousels. The Blue Costo Luggage Straps 4.4 $ 46"-78"
The Hibate Adjustable Travel Strap 4.5 $ 43"-78"
These luggage strap belts offered by Blue Costo are well-designed, sturdy, reliable, and stylish. Users love the bright colors, but some do note that the straps smelt terrible when they arrived. The Blue Costo suitcase belts feature an adjustable length from 46 inches to 78 inches, a width of 2 inches, and a secure buckle made of durable poly& plastic material. The package includes four straps – orange, blue, pink, and green and the straps fit 20”-32”suitcases. These straps are also offered in two pieces per pack or one piece package, and they are a perfect gift for any traveler. A customer comments that the suitcase straps arrived in a Blue Costo reusable bag and that they are flexible, easy to adjust, and very well made. He adds that the plastic buckle is sturdy and that he is very impressed with the quality. Another reviewer mentions that the straps are tight and that they don’t get loose during a long journey. A user also says that thanks to the bright colors it’s easy to recognize his baggage and that the luggage straps are more durable than he expected. He states that they are perfect for keeping your baggage safe and secure. However, some customers have complained that suitcase belt straps don’t stay tight and that they are slippery. Some users also note that they couldn’t tighten the straps at all and that they are disappointed by the quality. If you have problems securing your luggage, you might try these travel strap belts offered by Hibate. Users love that the straps are adjustable, but some do note that they get dirty very quickly. The Hibate luggage straps feature an adjustable length from 43 inches to 78 inches, a width of 2 inches, a durable plastic buckle, and bright colors for easy identification. The travel straps are suitable for 20”-32” suitcases if you use them horizontally, and for 20”-28” suitcases if you use them horizontally. They are also available in several colors, and you can choose between a one-piece package and a two-piece package. A reviewer mentions that it’s easier than ever to spot his bags from a distance thanks to the Hibate travel straps and that they are tight and well-stitched. He adds that he highly recommends them as the best luggage belts available. Another user comments that it’s a piece of cake to adjust the straps and that they are invaluable when waiting at terminals. He also says that the belts are holding up pretty well and that they have survived several trips with no issues. However, some customers have complained that the belts are not tight enough and that they tend to get loose during the flight. These heavy-duty travel straps offered by Tranvers are handy, practical, well-stitched, and affordable. Users love that the length is adjustable, but some do note that they have issues with the buckle. The Tranvers luggage straps feature a maximum length of 79”, a width of two inches, webbing design, non-slip, quick-release plastic buckles, and a built-in luggage identification tag. The luggage strap is suitable for 16” to 32” suitcases, and it’s available in several colors. You can also choose between a one-piece pack, a two-piece pack or a four-piece package. In general, users have a high opinion of the Tranvers travel belts, and they praise their design, usefulness, and durability. A reviewer says that the luggage straps are well-made and that she didn’t have any issues with them during her flight. She highly recommends them to anyone looking for the best adjustable luggage straps. Another user mentions that he has used these suitcase belts during four long trips and that the straps held better than he could imagine. A buyer also adds that the buckle is durable and that it’s easy to adjust the length of the straps. He states that the color of the straps makes it easier for him to spot his luggage. However, some customers have complained that the buckle is not strong enough to keep the straps in place and that they can get loose during transport. If you need a heavy-duty luggage belt to secure your luggage, you might take a look at these straps offered by Luxebell. Users love the length and the design, but some do note that they are overpriced. The Luxebell straps feature an adjustable length from 3.93 to 6.56 ft, a belt width of 1.96 inches, a quick-release, plastic buckle for security, and a thick ribbon weaving for durability. The travel bag strap is made of 100 % polypropylene fiber, and you can hand wash it with mild soap. It’s suitable for suitcase from 20” to 32”. A buyer comments that the buckle is durable, sturdy and that you shouldn’t worry that your luggage would open during transport. He adds that the belts are wide and thick and that they fit his 31” suitcase. Another reviewer mentions that the travel belts work perfectly and that he is very impressed with their quality. A user states that he used the straps on his trip to Iceland and he encountered no issues with them. He adds that the suitcase belts are well-stitched and that they arrived in an excellent condition. He highly recommends them as the best luggage straps available. However, some customers have complained that the straps are difficult to tighten. This extra long luggage strap offered by Wuudi is well-made, well-designed, and an excellent choice for securing your luggage. Users love the vibrant colors, but some do note that if you order the rainbow one, you get only one strap. 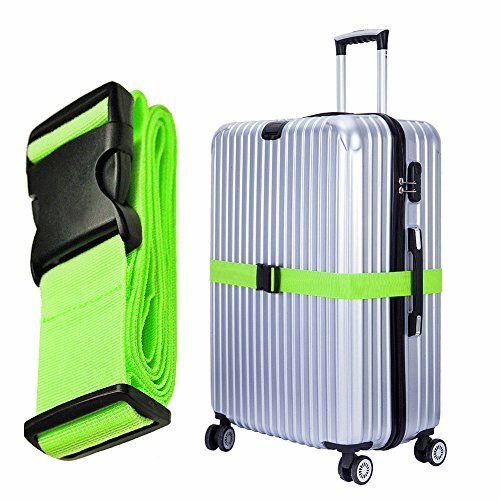 The Wuudi cross luggage straps feature a non-lock buckle, a lateral length of 200 cm, a longitudinal length of 230 cm, a width of 5 cm, and durable, unique design. The suitcase straps also have small icons with a reflective plane in silver to make it easy for you to identify your baggage at night. They are suitable for suitcase ranging from 10” to 32”, and they are available in four different colors. A customer shares that he was worried about the plastic buckle, but it didn’t pop open even once during his trip. He adds that the extra long strap is heavy-duty, easy to spot, and elegant. He highly recommends it as the best luggage belt available. 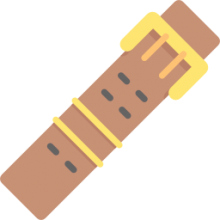 Another reviewer mentions that it’s very easy to adjust the length of the strap and that it arrived well packed. A user also adds that the straps fit well a 32-inch suitcase and that the color is bright and easy to identify from a distance. However, some customers have complained that the cross luggage straps are not very tight and that they tend to get loose. A user also states that he was asked to remove the belts at the check-in point at the airport because they get stuck. The first pair of luggage straps we took a look at is manufactured by BlueCosto- they come in a variety of different colors including pink, blue, orange and green. 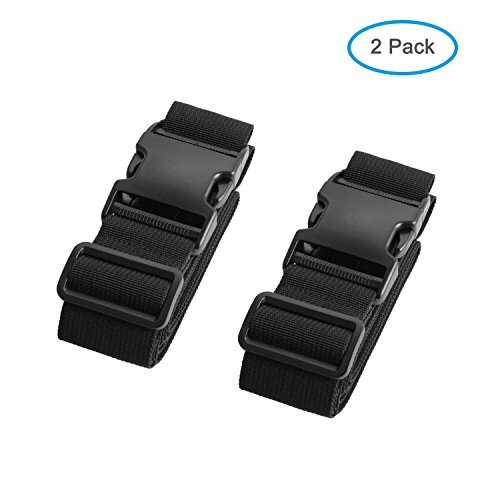 When you purchase, you receive two universal luggage straps that are marketed as ideal for buckling closed your suitcases. 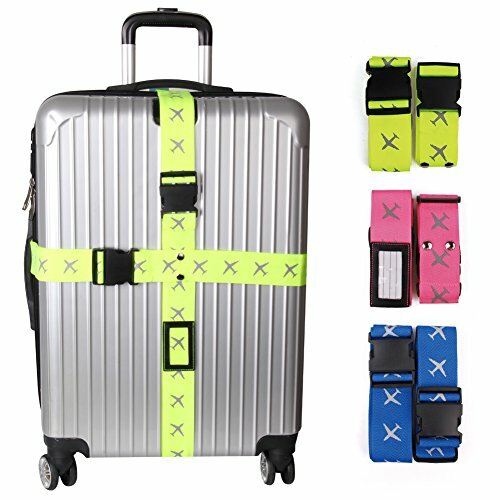 There very bright and various colors are designed to make it easy to spot your luggage when you arrive in an airport baggage pick up and are waiting for your travel bags to appear on the carousel. The luggage strap belts are built from what is described as a highly durable plastic and poly material that will not snap or bend outward or inward. Each belt measures between 46 inches in 78 inches with a 2-inch width and are ideally designed to fit suitcases that measure between 20 inches and 32 inches. Since these luggage straps have adjusters and clips you can even attach two suitcases together, as long as you measure to ensure the straps can accommodate the circumference of your travel bags. One international traveler who particularly spends a lot of time in China commends these luggage straps for providing a high degree of security, adjustable lengths, and a strong cordura nylon build that is reinforced with strong locking plastic buckles. Another frequent flyer told us that he has his luggage straps monogrammed to make them more identifiable and to decrease the risk of having them stolen. A novice world traveler bought these to secure his duffel bag and other assorted luggage- he was able to strap down his luggage crosswise keeping things tightly buckled and secure during an international flight with multiple connections. An interesting benefit, some users say, is that adding a luggage strap creates another handle, which makes it easier for the cargo and luggage people that work on airlines to you easily grab your gear, potentially decreasing the chance of it being damaged. Another reviewer who works as a traveling mechanic says that since his toolbox has a faulty latch he decided to bind it with a luggage strap. That way, it doesn't break open anymore during transit causing him to lose tools and receive everything in a big plastic tub when he gets to his destination. The second adjustable luggage strap and suitcase belt we took a look at is manufactured by Hibate. It comes in a variety of highly identifiable colors including blue green pink orange and multicolor-with straps that measure 43 inches all the way up to 78 inches. Reviewers say that you can actually attach two straps together, making it easier to book 2 suitcases into one bulky rolling package. One buyer who uses them traveling back home for Thanksgiving break was pleasantly surprised at how immediately identifiable his luggage was after having strapped it with these bright and colorful package straps. Indeed, most buyers concur that these are tough and rugged customizable straps that work on hard sided as well as fabric luggage- helping your cherished possessions survive rough manhandling from TSA agents and uncaring baggage claims people. The third suitcase and luggage strap we examined is manufactured by Transvers. It includes an address tag built into the strap- ideal for suitcases that measure between 16 inches and 32 inches. A quick-releasing buckle means that it's a cinch to unbuckle, ensuring that should a TSA agent need to inspect your cargo-meaning they don't cut through your straps if they were key or code locked, for example. As well, because these luggage straps also include an identifier you won't need to attach luggage tags to it. Overall, the manufacturers advertise it as a simple and effective means of protecting your baggage, uprights, rolling duffel bags and suitcases from accidentally crashing open during difficult and long airline travels and theft from airline workers. One reviewer who travels within the domestic United States frequently on the United Airlines told us that he outfitted is rolling toolbox with it, saying that it was a sturdy means of holding together his instrument cargo. Another married couple picking a honeymoon to Thailand told us they use the straps on soft fabric luggage, though they decided to use their existing luggage tags rather than employ the ones included with these heavy duty luggage straps. The fourth pair of adjustable locking luggage straps we took a look at is manufactured by Luxebell. They are constructed from polypropylene fiber, with a belt length of 3.93 to 6.56 feet, employing a 1.96-inch wide belt. It is advertised as a suitable universal strap option for suitcases that measure between 20 inches and 32 inches. A quick release option makes it easy to unbuckle your bags should TSA agents need to investigate their interiors. 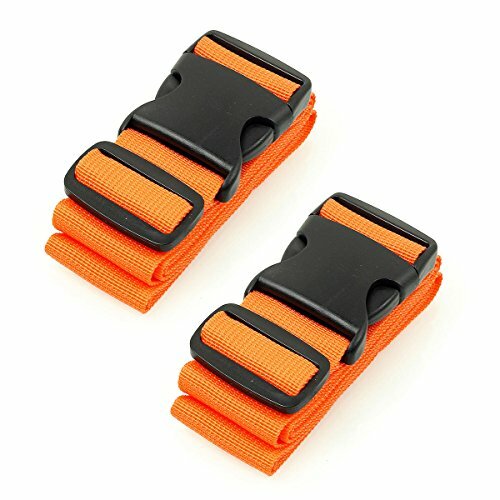 Overall, this plastic adjustable buckle is engineered to be a quick-adjusting and flexible, anti-theft option that straps in luggage securely for long-term, extended use. Many buyers have endorsed it for flight check-in's saying that their extreme adjustability ensures that it can fit with any type of suitcase. Indeed- a great means of protecting against baggage abuse as well as increasing the visibility of your luggage. 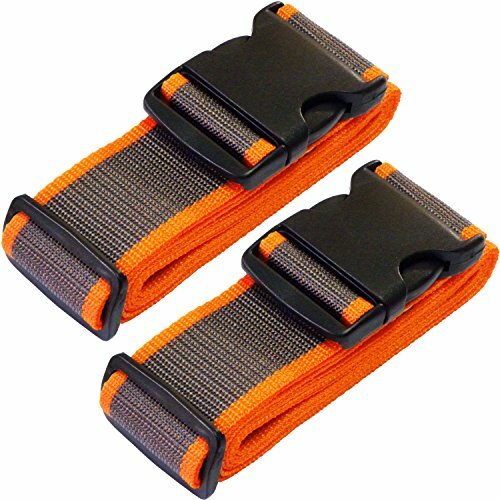 The last pair of extra-strength luggage straps we examined is manufactured by TechSmile. They ship in blue, fluorescent green, pink and rainbow options with reflective plane icons, helping increase their visibility at night. The rainbow option does ship it with a combination lock as part of its buckle. The advertisers describe it as useful when you are traveling domestically or internationally to help secure your duffel, upright or suitcase from accidentally opening and enduring tumultuous handling experience of airport baggage handlers. The different color options make it highly visible on the luggage carousel. One buyer advised us that when using, do you want to make sure that if your luggage has a retractable handle that the strap goes beneath the handle and not above it so you don't effectively lock yourself out from using the pull handle on your rolling luggage. Another reviewer who experienced the trauma of an exploded luggage bag- and seeing all of her clothes, underwear and travel possessions strewn across the airport lounge's floor- purchased one of these luggage straps to ensure she never had to endure that drama again.